Sweetness is meant to be enjoyed. 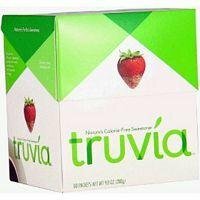 That's why Truvia created products meant to reduce sugar, not taste. The clean, sweet flavor contained in Truvia Spoonable Natural Stevia Sweetener comes from nature in the form of the stevia leaf. Leaves don't dissolve well in beverages or baked goods, so we extract the sweetness from the stevia leaf. Because stevia leaf extract is 200x sweeter than sugar, we balance the sweetness with erythritol, a sweetener produced by fermentation. Erythritol is also found in fruits like grapes and pears. This gives you the sweet white crystals you love, without the sugar calorie. The lid opens to allow for measuring spoons to scoop up the sweetness you need when cooking. Whether you spoon it, pour it, or sprinkle it, this Spoonable jar is great for measuring just the right amount of sweetness you crave. If you have any questions about this product by TRUVÍA, contact us by completing and submitting the form below. If you are looking for a specif part number, please include it with your message.